In August 2016, the Baltimore Orioles donated more than $14,000 to the FMA Foundation’s Resiliency Campaign to benefit Fort George G. Meade. 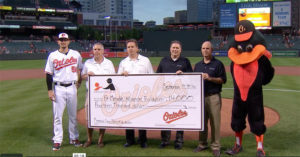 To date the Orioles have donated more than $83,000 to the Foundation. The FMA Foundation is a 501(c)3 non-profit organization that addresses critical needs across the FortMeade region. The Foundation’s initiatives support the Fort Meade installation, military personnel and their families, civilians and the broader Fort Meade community. Military & Family: Establishing a Resiliency Campus at Fort Meade for service personnel, their families and civilians at the installation, providing expanded services for the five areas of resiliency: physical, emotional, social, family and spiritual. The plan includes the renovation of Kuhn Hall and its conversion into an education and resiliency center to serve as the hub of information, programming and services for the Fort Meade community. Education: Promoting the importance of science, technology, engineering, math and linguistics careers through education programs, initiatives and an annual scholarship program. Thanks to the generosity of supporters like you, the Foundation has outfitted the Soldier and Family Assistance Center, built playgrounds and batting cages on Fort Meade, provided monthly snacks to the Wounded Warriors Transition Unit, awarded scholarships to three Meade High School graduates and more.